Be a part of CLT250! Did you know that the City of Charlotte turns 250 this year? On July 3, CLT250 officially kicks off at Memorial Stadium at the Star Spangled Spectacular. Festivities include fireworks, food and entertainment. While this is the first event in a year-long celebration, CLT250 is much more than a celebration; it’s about building our community together and making an impact on the next 250 years. That’s where we need your help. The city needs volunteers to represent CLT250 and share community building and volunteer activities with attendees. To mark the 250th anniversary of Charlotte’s founding our community is invited to engage in a year of festivities filled with events large and small. All Charlotteans, new and long-time residents, as well as friends of our city are invited to share and commemorate our storied past. Together we will celebrate our city’s ingenuity, determination, collaboration, compassion and resiliency; and imagine our city’s future abundant with hope, opportunity and justice for all. Think about it. We have an opportunity to shape Charlotte’s future together in a way that will have a lasting impact. This work isn’t much different than what the city does on a normal basis, and city employees are already thinking of ways to leave a legacy in the work we’re already doing. Within the past couple of months, a group of employees gathered to share how their departments could start incorporating CLT250 into city projects. This group had representatives from all departments and together they came up with some great ideas. 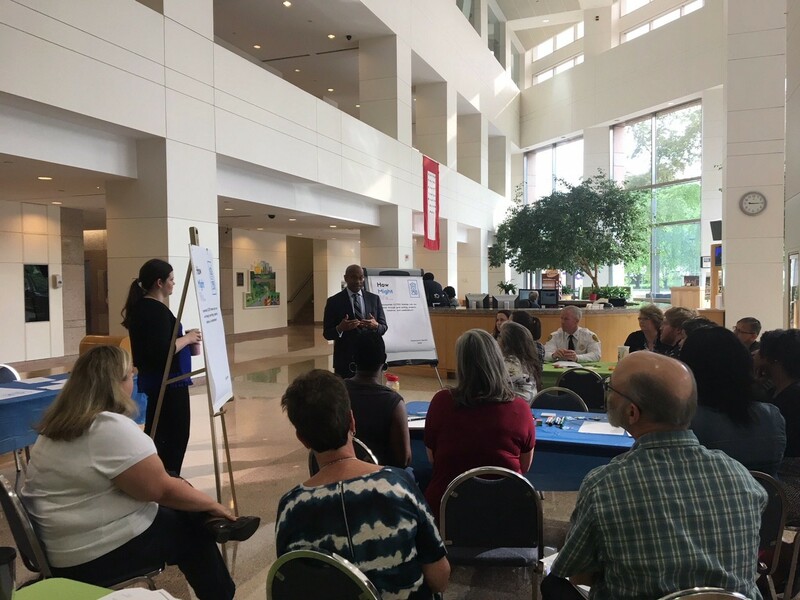 City Manager Marcus D. Jones engages in employee brainstorming session for CLT250. This is just a taste of the projects that will leave a legacy. It goes beyond the city. Everyone in the community is encouraged to make their own commitment in honor of CLT250. If you have a commitment you’d like to share, please contact Sarah Hazel with the City Manager’s Office. Visit www.CLT250.com for more information!